University of engineering and technology Lahore admission 2019 open now for all the programs that they offeres. UET Lahore is one of the famous universities in Pakistan that offeres admission twice a year. All the students of Pakistan wishes to get admission in this university because this is number one engineering university in Pakistan. If you are going to apply for admission should read all this aritcal because in this post we have written all details like UET Lahore admission 2019 last date, advertisement, application form download, entry test result answer keys and much more. UET Admission 2019 all the candidates from Punjab domiciles are inveted to submit their application form before the last date ends. 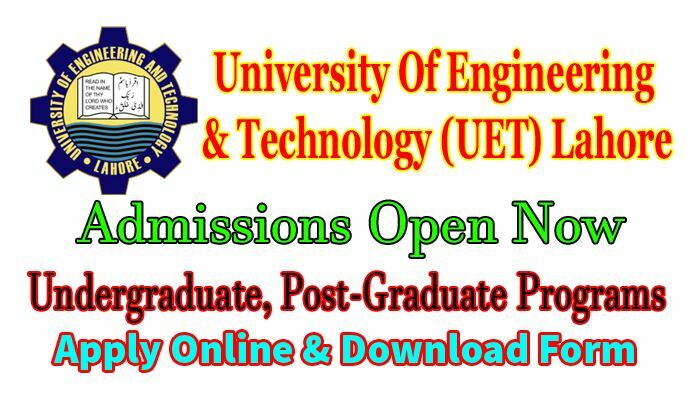 University of engineering and technology Lahore admission 2019 last date is September 2019. University of engineering and technology Lahore was established in 1921 at grand trunk road Lahore. It was affiliated with Punjab university in 1932. Now it is affiliated with Punjab engineering council. 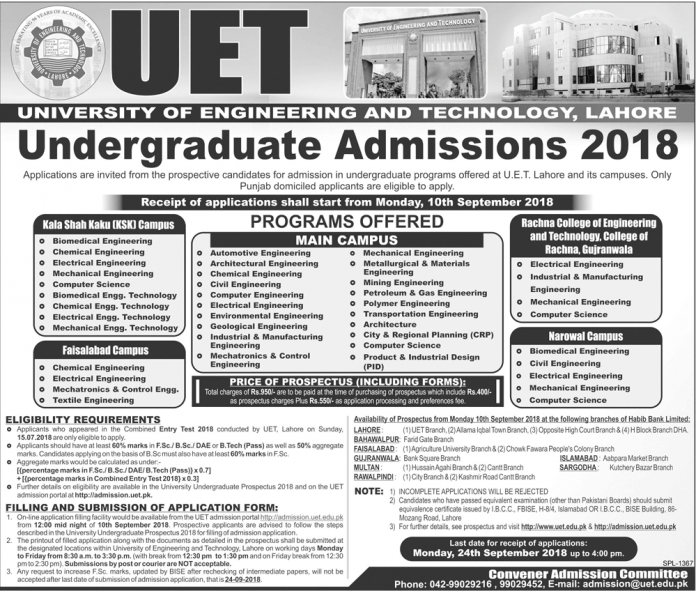 UET Lahore offeres admission for undergraduate, postgraduate engineering degree programs. Uet Lahore is famous as thousands of students get admission in this university and a lot of students apply for. UET have two campus, one in Lahore and second one is in Kala Shah Kaku. UET Lahore 2019 admission advertisement is here at webstudy.pk from where you can check all the details like eligibility criteria. It provides all most all the basic facilities to the students so that they can study in comfortable environment. Institute provide airy class room, air conditioned labs, library, canteen, play grounds, common rooms, well educated faculty and highly trained staff. If you wants to get admission in this university then you have to pass ECAT test. University display merit list after counting exams marks and ecat marks. Here at webstudy.pk you check all the universities in Pakistan admission, merit list, entry test result. You can also download free model papers, guess papers, notes and past papers of each class and subject. All the candidates who have appeared in ECAT july 2019 conduct by uet Lahore are eligible to apply for admission. Candidate should have minimum 60% marks in F.Sc, B.Sc, DAE, B.Tech and 50% aggregate marks. More details are available on university prospectus and on the uet official website. First you have to register yourself online on official website of uet then print out the registration form then deposit Rs. 500/- to university HBL bank branch. Attach all the required documents and send it to the admission office uet Lahore. You can also buy a prospectus of UET Lahore that contains admission form.